Back in the day the only distinction comic book fans had to worry about was Marvel versus DC. But with Marvel Comics’ characters licensed to multiple studios and the term “Marvel movie” used as shorthand for the stuff produced by Marvel Studios (a.k.a. The Marvel Cinematic Universe), these intellectual property distinctions can get quite confusing. This latest Fantastic Four features Marvel characters and a Marvel logo, but it’s not really a “Marvel movie” in the colloquial usage. This infographic by Reddit user CyanShades is the latest of many charts and graphs designed to simplify things for those who have somehow managed to avoid hearing about this stuff by now. It juxtaposes the MCU films with the Marvel stuff made by 20th Century Fox and Sony. It also points out some interesting minor distinctions between the two. 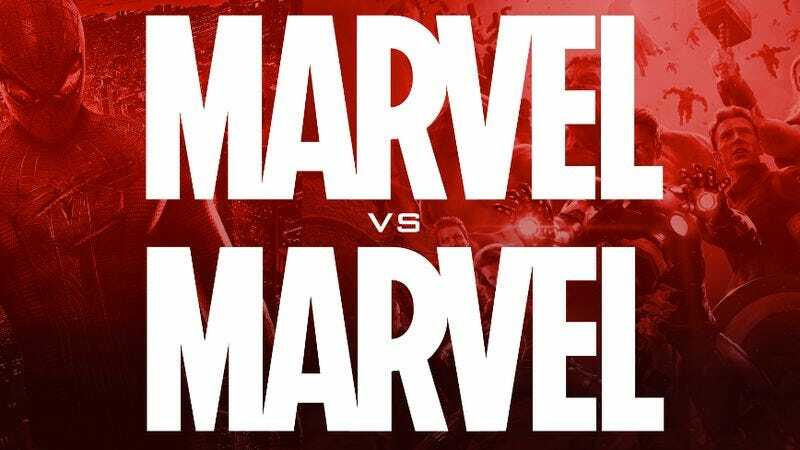 For instance, movies made by Marvel Studios now use a logo with a 3D comic panel flipping effect while those simply licensed from Marvel Comics use a 2D one. Plus only MCU films feature the Marvel logo above their titles. There’s nothing Earth shattering here, but it’s always fun to see the latest Fantastic Four’s absurdly low nine percent Rotten Tomatoes rating in print.